In January, 2008 I bought out my partner and changed the name to Cricket' Café. I purchased some land and began the design of a new building. The building was designed by my husband and I at our kitchen table over many nights of erasing until we were both satisfied with the inside and outside layout of the building. The outside design fell into a sort of lifestyle center setting with old world street lights surrounding the building and accenting the outdoor seating. While the colors all complement each other in a Tuscany kind of way with music softly playing in the background. This Tuscany style impression overflows into all customer viewing areas to include the café, meeting rooms, kitchen and even the powder rooms that also reflect a sense of humor. We broke ground in June of 2008 and opened our doors for the first time on October 6, 2008. In our new location we were able to provide more seating in the café, more in depth menu, Drive-thru, Off site catering, corporate meeting facility, with meals if desired, Hi –definition projectors in all three meeting rooms, power point accessories, screens & wireless internet. Cricket's environment provides a place for all to enjoy their favorite cup of coffee, breakfast, pastries, dessert or lunch. Whether you are; part of an event, trading in the office atmosphere for the café setting, meeting with friends or just surfing the internet. 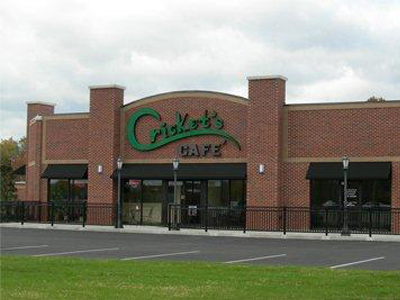 Cricket's is here for your convenience.